Recent factory extension requires acoustic treatment. Factory Noise Control: a factory shell comprising hard roof, walls and floor is a large echo chamber. The sound of production and machinery reflects off the hard surfaces to build to substantially increased noise levels within. Escaping noise may be an environmental nuisance warranting the attention of the local authority. The typical answer to factory noise control is the design and installation of expensive acoustic machinery enclosures with forced ventilation to prevent machines overheating; this will address the noise that is enclosed but will not address the basic problem. A factory extension was needed for HV Wooding Ltd, Hythe. A decision was made to include sound absorption in the building design for factory noise contro, reducing reverberation and ambient noise both inside the factory and outside to the local environment. The acoustic consultant recommended that the lower half of the walls should be constructed from SoundBlox: Oscar Acoustics’ acoustic masonry blocks. These would help with factory noise control at low level (low frequency in particular), whilst being robust enough to take the daily wear and tear of a factory. The corrugated ceiling in the main area was treated with 20mm of SonaSpray K-13 White. 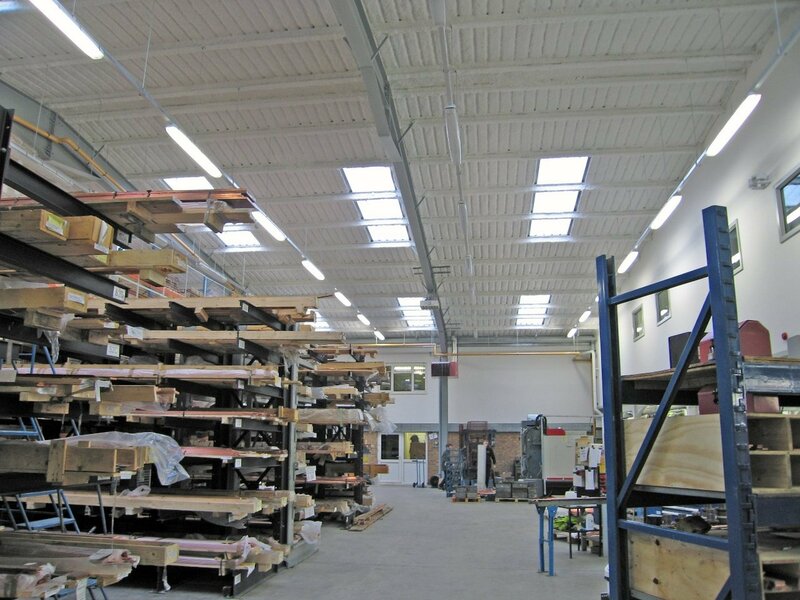 This was not only very efficient at absorbing the sound directed towards the ceiling it was also excellent at reflecting the light, making the factory area much brighter. For the low mezzanine areas, SonaSpray K-13 in light grey was chosen. This provided an acoustic decorative finish with little to no required maintenance in a colour that was less likely to show the dirt. Oscar Acoustics worked with main contractors W.W. Martin to complete the installation of the SonaSpray in just 1 week, achieving superb factory noise control with minimum disruption to their building programme. Managing Director John Wooding stated that he was delighted with the factory noise control and the performance of the SonaSpray ceiling and SoundBlox in achieving low noise levels. 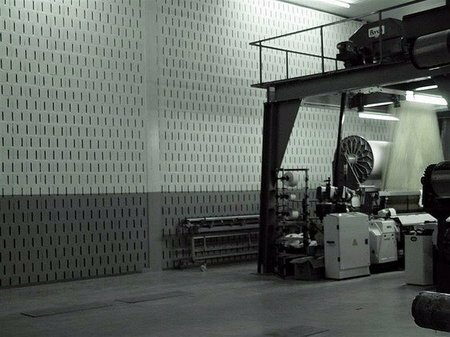 Noise from the sources in the factory is absorbed by the acoustic finishes therefore the factory noise control is as required: reverberation is minimal and noise levels are low. Simple screens are effective protection for operators from direct machine noise because the reflected noise is eliminated. Noise levels in the adjacent offices are also significantly lower. HV Wooding produces millions of precision engineered components and assemblies to many diverse industry sectors across Europe and the world. For more information regarding our factory noise control materials or if you have any questions regarding building acoustics you can call us direct on 01474 854902. Alternatively, please fill in our enquiry form via our contact us page and we'll get back to you as soon as possible. Factory noise control artical written by D. Mack.